Independent reading is a term coined to describe when students choose books of their own interest, read on their own time, and in their own place. The reading isn't assigned nor is it assessed!! Over the years, independent reading has been called SSR (Sustained Silent Reading), DEAR (Drop Everything and Read), DIRT (Daily Independent Reading Time) or GRAB (Go Read a Book). However, the concept has never changed. Students are allotted 15 minutes or more to read; that's it, just read. From a librarian's perspective, it is a beautiful thing!! Sadly, the increased rigor of the instructional day is squeezing out this vital component of the literacy curriculum. Some teachers may mistakenly believe that they DO NOT have time for kids to simply read. Research shows, time and again, that teachers can't afford to skip independent reading. In fact, independent reading provides students with the opportunity to practice the reading skills that have been modeled for them during instruction. It improves reading achievement, builds vocabulary and fluency, and increases background knowledge. However, independent reading won't be nearly as effective, if students are merely given fifteen minutes after lunch or at the end of the day to read willy nilly. They need access to a strong library. They need to read at their own comfort level. And perhaps more importantly, they need to need be accountable for their reading. There are many hotly debated commercialized programs, like Accelerated Reader and Reading Counts, that use computerized testing to monitor students' comprehension. There are a few similar free websites like Book Adventure and QuizWik. Personally, I am not a fan of reading quizzes to test students, but that is a whole 'nother post. My school has never purchased a commercialized program, so I needed to develop a program that worked for me in my classroom. I wanted my students to be accountable for their reading. My idea of independent reading wasn't the random reading that I was observing my students doing. They were actually picking up different books every day. What? I needed an easy to manage way to monitor their reading. If you are looking for an alternative to quiz based reading, the foundations of this program may appeal to you! Many professionals will recommend that educators drop everything and read while their students are doing so! However, as a classroom teacher, I could NEVER have done this. Not that I didn't desperately want to, but I felt that I needed to be with my students ... circulating, conferencing, checking in. I strongly believed that my involvement in their reading was the foundation for their success. We had independent reading for twenty minutes after lunch, and I was usually actively involved for all twenty minutes. Be involved in your students' choice of reading materials. Yes, independent reading should be a time for students to choose their own books. However, they should also be choosing books that are a good fit for them! As students are reading, speak with them about their books. Ask them why they chose their books. Have them read a page aloud for you. Ask them a question that helps you to determine their understanding of the premise. This should not be a time for nit picky questions, but more general. For example ... "The cover shows a boy with his dog. Can you tell me a little bit about their relationship?" This allows students to share what they know without making them feel as if you are testing them. Require students to be accountable for their daily reading. Teachers have been doing this since the dawn of time: book summaries, reading logs, sticky notes, and reading journals ... just to name a few! As a classroom teacher, I tried them all and VERY quickly became weighed down in paperwork and was unable to keep up with students daily reading. So, I devised a simple bookmark that would allow me to track a students reading with just a glance. Students would record the date on the left and the page numbers that they read on the right. For example, they would record 9/25 and then 6-23. If they read more than once during the day, then they record more than one entry. I LOVED this ... Kids were accountable, and I wasn't entirely bogged down in logs, journals, and sticky notes. The kids really liked this too. How could they not? It is painless! Encourage students to be accountable for the books that they have read and to keep a reading log. Have students keep a list of the books that they read throughout the year. There isn't anything quite as affirming for students as to watch their logs get filled up. You don't need anything fancy ... a simple log like this one will do ya!! Every kid will try to tell you, at least once, that they have read a book that they really haven't. That's what I love about the bookmarks! With a quick glance you can see how much that students are reading in one sitting. It is has now become really easy to tell whether or not students are reading a whole book. If a student is averaging 10 pages a day and then all of a sudden, they complete the last fifty pages in one day, something's up! 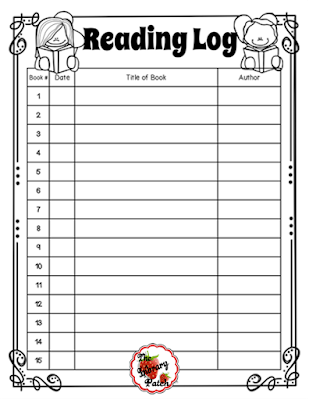 Before students were allowed to record a book on their reading log, I would need to conference with them. Students would leave their completed book in the corner of my desk, and when I had a few minutes, I would call them up to chat. A quick two or three minute discussion, in conjunction with their bookmarks, is really all that I needed. I also had a strict rule that students were NOT allowed to abandon a book unless we had a conversation about their choice. Personally, I believe that life is too short and there are too many great books, to finish a book that you aren't enjoying! But, I wanted students to be able to verbalize their dissatisfaction. This also created a perfect opportunity for me to suggest another book. This tip may not be very popular with everyone! Many of you may want to say that students should read for the intrinsic value in it. As a librarian, that would be my DREAM!! However, reality can prove otherwise. Some students are truly motivated with a little extrinsic reward. 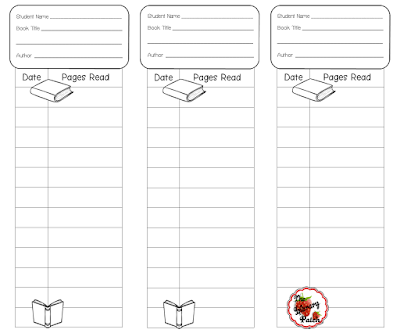 So, each time that a student added a title to their reading log, they received a sticker on their Reading Chart. You can use the prepackaged charts found at many teacher stores or create one yourself. Here's an example of a super simple one. Each time that a student completes a chart, you may consider a reward! A few of my students' favorite rewards were free books from the next Scholastic Book Order and free periods in the library. When I was running this program in the classroom, I had problems with a few of my stickers falling off of the charts. Then, I had a problem with a little hoodlum taking stickers from one chart and adding them to his. Clearly, this was very upsetting to the students as they were earning prizes when they finished a chart. This problem was solved easily by numbering the books on the Reading Log. If students had ten books on their log, they should have ten stickers on their chart. As a current librarian, I want to encourage all teachers to keep independent reading as part of your literacy program. Speaking from twelve years in the classroom, I believe that this concept is easy to manage and will strengthen your existing independent reading program. The BASIC program is free for your use. 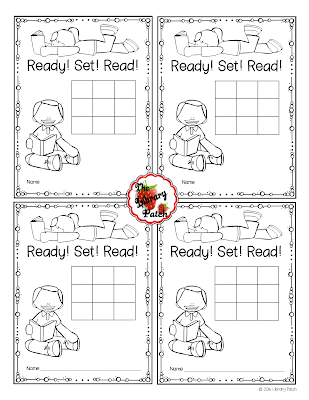 It includes step by step directions, a letter to send home to parents, a book note for parents to complete when their child finishes a book at home, bookmarks for students to track their reading, reading logs to track their books, and reading charts for display. If you think that you could use any of these tips, forms, or charts click on the box below!! 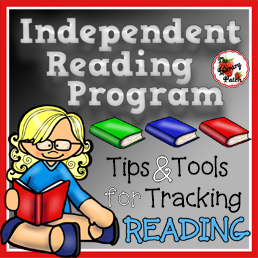 In an effort to promote reading everywhere, The Independent Reading Program is FREE at my TpT Store. I know that we take our jobs in reading promotion seriously! Although it is often one of the most satisfying aspects of our job, it can also be the most challenging. Some of you may be in charge of implementing your school's commercialized programs, while some of you may support your teacher's in their individual classroom's reading programs. But, consider what I am doing. Each year, I have a library theme, and I run THIS same independent reading program school-wide. I provide the teachers with letters home to parents, with theme related reading charts, and with supporting lessons in the classroom. Teachers maintain the book conferencing, reading logs, and charts in the classroom. I am in charge of the incentives. As students finish a chart, they bring it down to the library. I give them a new chart and a prize of their choice. Prizes include free books, pencils, a free library period, a no homework coupon, and ice cream coupons that can be redeemed in the cafeteria. Perhaps, a school-wide program is not feasible for you. But, maybe a teacher or two might be interested in the program! I believe that anything that we can do to support our teachers in their reading program is beneficial to everyone involved. 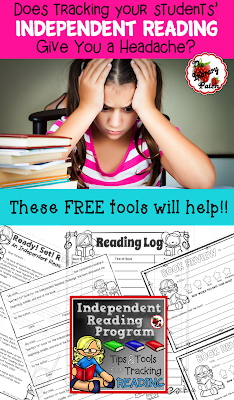 I have several independent reading programs tailored to specific themes with bundles of bookmarks, logs, posters, charts, folder covers, and prize coupons available at my TpT store.